Dimensions: 12" x 0.5" x 4"
Dimensions: 7" x 0.5" x 4"
The ViscoHeel® provides a soft cushion for the heel and reduces shock loads on the ankle, knee, and hip with every step. 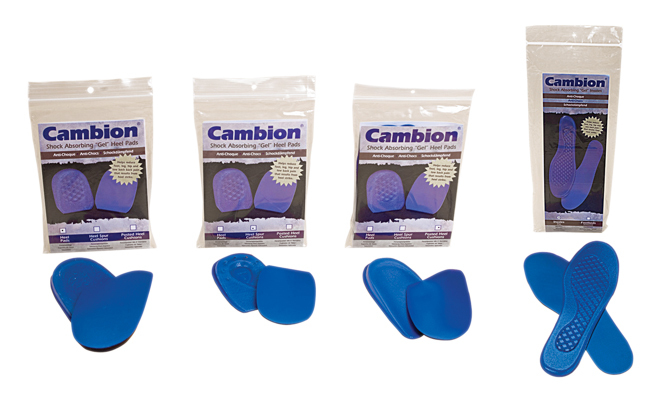 The anatomically contoured wedge-shaped heel cushion provides noticeable relief for calf muscles and tendons. The viscoelastic, skin friendly material reduces shock loads and discomfort to the ankle, knee, hip and spine. This ViscoHeel® comes in size 0, which is a perfect fit for children. Dimensions: 8.75" x 1.12" x 3.25"
The ViscoHeel® provides a soft cushion for the heel and reduces shock loads on the ankle, knee, and hip with every step. 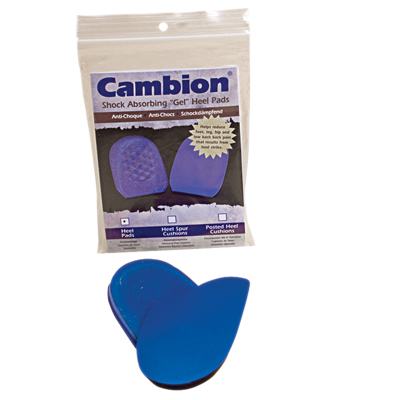 The anatomically contoured wedge-shaped heel cushion provides noticeable relief for calf muscles and tendons. The viscoelastic, skin friendly material reduces shock loads and discomfort to the ankle, knee, hip and spine. This ViscoHeel® comes in size 1, which is a perfect fit for Women's shoe size 3½ - 5 or Men's 2½ - 4. Dimensions: 8.75" x 2.13" x 3.25"
The ViscoHeel® provides a soft cushion for the heel and reduces shock loads on the ankle, knee, and hip with every step. 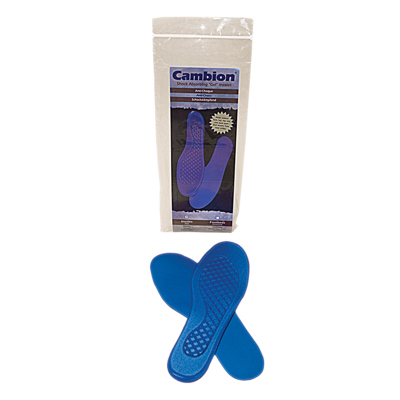 The anatomically contoured wedge-shaped heel cushion provides noticeable relief for calf muscles and tendons. The viscoelastic, skin friendly material reduces shock loads and discomfort to the ankle, knee, hip and spine. This ViscoHeel® comes in size 2, which is a perfect fit for Women's shoe size 5½ - 8 or Men's 4½ - 7. Dimensions: 8.75" x 3.13" x 3.25"
The ViscoHeel® provides a soft cushion for the heel and reduces shock loads on the ankle, knee, and hip with every step. 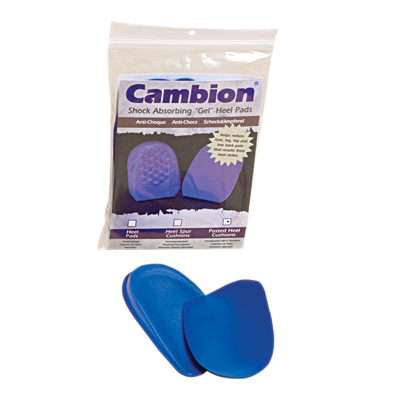 The anatomically contoured wedge-shaped heel cushion provides noticeable relief for calf muscles and tendons. The viscoelastic, skin friendly material reduces shock loads and discomfort to the ankle, knee, hip and spine. This ViscoHeel® comes in size 3, which is a perfect fit for Women's shoe size 8½ - 11 or Men's 7½ - 10. Dimensions: 8.75" x 4.13" x 3.25"
The ViscoHeel® provides a soft cushion for the heel and reduces shock loads on the ankle, knee, and hip with every step. 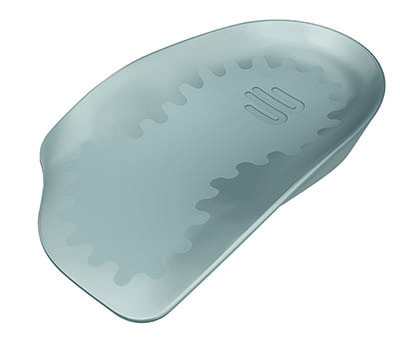 The anatomically contoured wedge-shaped heel cushion provides noticeable relief for calf muscles and tendons. The viscoelastic, skin friendly material reduces shock loads and discomfort to the ankle, knee, hip and spine. This ViscoHeel® comes in size 4, which is a perfect fit for Women's shoe size 11½ - 13 or Men's 10½ - 12. Dimensions: 8.75" x 5.13" x 3.25"
The ViscoHeel® K is a gently supporting heel cushion that is used as a corrective measure for knock-knees or bandy legs. It slightly corrects the malpositioning of the heel and therefore alleviates associated pain. The raised wedge can be placed medially or laterally to correct pronation/supination of the heel, or varus/valgus alignment of the knee. The heel is guided away from the inward tilt typical for knock-knees (valgus position), and from the outward tilt typical for bandy legs (varus position). Unilateral stress on the locomotor system is counteracted, which results in a general strain relief from the foot right up to the lower back. Pressure peaks are reduced, and joints are relieved and protected from advancing osteoarthritis. The viscoelastic heel cushion optimally adapts to the shape of the foot and shoe. It is made of high-quality, non-slip silicone that is gentle on your skin, easy to clean and particularly durable. 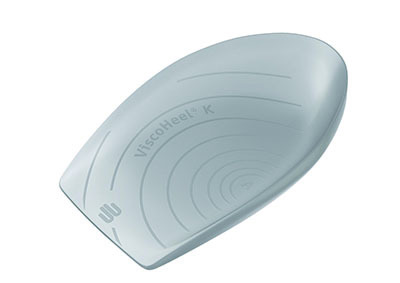 This ViscoHeel® K comes in size 1, which is a perfect fit for children. Dimensions: 8.75" x 6.13" x 3.25"
The ViscoHeel® K is a gently supporting heel cushion that is used as a corrective measure for knock-knees or bandy legs. It slightly corrects the malpositioning of the heel and therefore alleviates associated pain. The raised wedge can be placed medially or laterally to correct pronation/supination of the heel, or varus/valgus alignment of the knee. The heel is guided away from the inward tilt typical for knock-knees (valgus position), and from the outward tilt typical for bandy legs (varus position). Unilateral stress on the locomotor system is counteracted, which results in a general strain relief from the foot right up to the lower back. Pressure peaks are reduced, and joints are relieved and protected from advancing osteoarthritis. The viscoelastic heel cushion optimally adapts to the shape of the foot and shoe. It is made of high-quality, non-slip silicone that is gentle on your skin, easy to clean and particularly durable. This ViscoHeel® comes in size 2, which is a perfect fit for Women's shoe size 5-9 or Men's 3½ - 7 ½.
Dimensions: 8.75" x 7.13" x 3.25"
The ViscoHeel® K is a gently supporting heel cushion that is used as a corrective measure for knock-knees or bandy legs. It slightly corrects the malpositioning of the heel and therefore alleviates associated pain. The raised wedge can be placed medially or laterally to correct pronation/supination of the heel, or varus/valgus alignment of the knee. The heel is guided away from the inward tilt typical for knock-knees (valgus position), and from the outward tilt typical for bandy legs (varus position). Unilateral stress on the locomotor system is counteracted, which results in a general strain relief from the foot right up to the lower back. 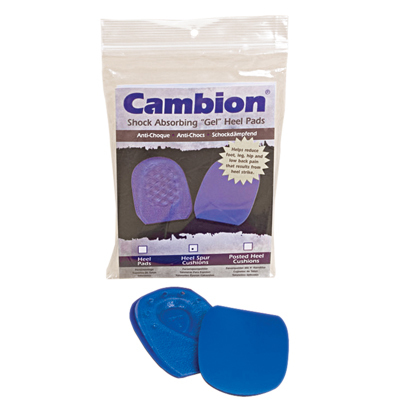 Pressure peaks are reduced, and joints are relieved and protected from advancing osteoarthritis. The viscoelastic heel cushion optimally adapts to the shape of the foot and shoe. It is made of high-quality, non-slip silicone that is gentle on your skin, easy to clean and particularly durable. This ViscoHeel® comes in size 3, which is a perfect fit for Women's shoe size 9½ - 14 or Men's 8 - 12 ½.
Dimensions: 8.75" x 8.13" x 3.25"
Adjustable Heel Lifts allow you to add up to 3/8" of lift instantly or peel away one or two layers to create a 1/4" or 1/8" lift in just seconds. Resilient rubber layers maintain their corrective lift while still helping absorb shock at heel strike. Attractive leather top cover adds durability. These heel lifts are also a great progressive treatment for Pelvic obliquity, Plantar Fasciitis and Achilles tendonitis. Use bilaterally to help relieve stress on the heel cord and plantar fasciia. Use with a post-op shoe to eliminate pelvic obliquity. This product is not made with natural rubber latex. 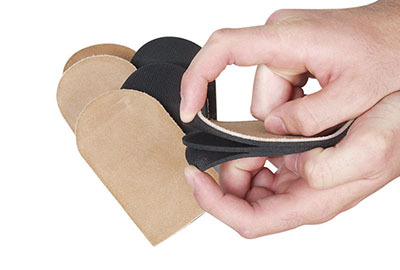 Heel Lift Sizing: (Small) fits most women, approximately 2"W x 4-1/4"L ; (Medium) fits larger women and smaller men, approximately 2-1/2" W x 4-1/2"L ; (Large) fits most men, approximately 3"W x 5"L.
Dimensions: 4.5" x 2" x 2.5"
Dimensions: 4.25" x 1.5" x 2"